Addressing food shortages in the region, the traditional habits of eating insects and the need to create economic opportunities in Uganda and Kenya, the Flying Food project aims to develop an inclusive value chain on rearing crickets for consumption and marketing. The programme is led by TNO and implemented by ICCO Cooperation in partnership with ADS, BoPInc, and private sector partners Venik and Jagran and knowledge institutions (HAS Den Bosch and BUC). The programme is funded by FDOV. Insects like lake flies, termites, grass hoppers and crickets are traditionally collected and consumed in Kenya and Uganda and are highly nutritious. A 2011 market exploration in Kisumu, Kenya confirmed that > 80% of the population consume insects whenever they are in season and are interested in processed insects as ingredient for other products. Since 2010 a consortium of Dutch and Kenyan partners are supporting farmers in Kisumu to pilot the rearing of crickets for consumption. During 2012 SIDA allocated funding to carry the pilot further and analyze opportunities for commercialization. In the Masaka region of Uganda up to 250 local entrepreneurs collect, process and trade grasshoppers on large scale during two short periods per year, which is a lucrative business. Based on these experiences a multi-annual proposal for the development of inclusive value chains on crickets for consumption in Kenya and Uganda was formulated. By mid-2013, the Flying Food consortium, led by TNO and including public as well as private partners from Kenya, Uganda and the Netherlands obtained funding from the Ministry of Foreign Affairs for this innovative proposal. The consortium will realize a system innovation by completing seasonally collecting insects in the wild with year round rearing and supply of crickets. With a market-based approach at least 4000 small scale cricket farms will be established in Kenya and Uganda. The crickets will be dried for direct consumption or for further processing into flour to serve as an ingredient for new food products (like blend flour, cakes, samosaâ€™s, meatballs, etc.). Food design, the development of recipes, consumer testing and marketing campaigns are included in this project. The project will increase availability and accessibility of nutritious quality food at local markets to 1,000,000 people at the BoP and facilitate entrepreneurship and income generation through inclusive value chain development. Who is Charles Ochiel Odira? When Charles came back from Thailand he started cricket rearing. “It’s not heavy, you just need to clean, feed and water them at specific times. However, that does require dedication. I noticed women are better at this than men. In Berlinda I found my perfect employee to take care of the crickets. The crickets like her and she loves them. Since she started the volume is rapidly increasing. Charles is also part of the cricket cooperative, of 65 farmers. Counting with an established local enterprise Charles has been requested to officially manage an earmarked loan from the Achmea Foundation. This is meant for the purchase of a set of 30 crates for commercial cricket rearing by smallholder farmers. Through the project these farmers will receive training and ‘on-the-job’ advice on rearing, processing and marketing. In addition Charles will be able to provide ‘parents stock’ on a commercial basis to farmers who start rearing. The ambition of the Flying Food project is to establish at least 300 cricket farmers during 2017 and create the basis for an inclusive and climate resilient value chain. The increase in numbers of farmers and amounts of production needs to go hand in hand with the development of the processing capacity and the market. At least during the initial phase farmers will start selling their crickets to Charles for a fixed price. They have a guaranteed market and earn a steady income. 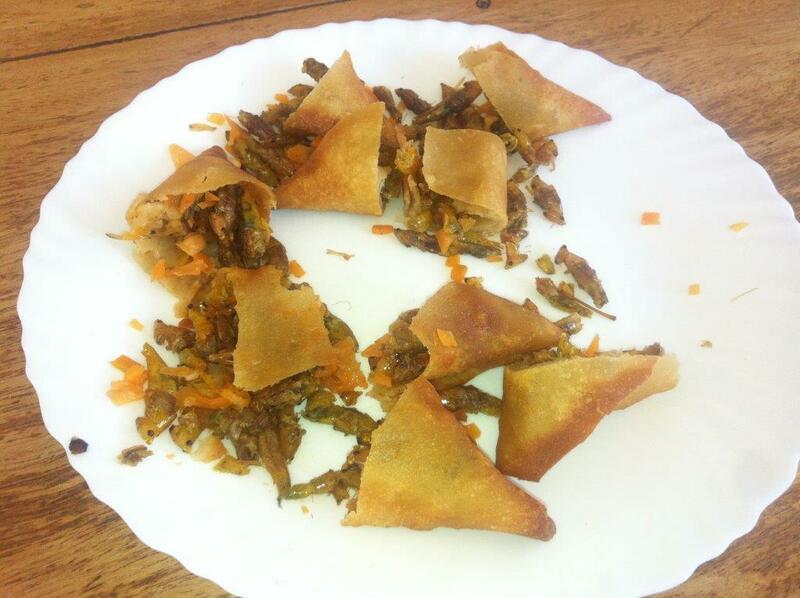 And on the other hand Charles processes the crickets in for example crickets cakes, and profits when he sells these in his stores in Kisumu. The project is based on a business case that is sustainable, supported by business driven actors: farmers, already earning from their farming activities. They have already demonstrated willingness to invest, with support of financing mechanisms, in starter kits for rearing and will achieve break even within a year, while consuming and selling their production. Cooperative break even is estimated around 2 months, due to low level of investments and high volume. Processors in the value chain have already commercial activity and are ready to invest in new tools for processing, to generate increased revenue. Their break even point after investing in new processing equipment is expected after 2 years. Traders and Retailers have no investments. Profit margins along the value chain are considered typical for the respective countries (Farmer 27%, Cooperative 5%, Processor 9%-12%, Retail 12%). In Uganda, there is already a financially sustainable model existing for seasonal collection and sales of grasshoppers. Recent research has shown that insects produce much less greenhouse gas than usual livestock. For example, pigs produce 10-100 times more greenhouse gas per kilogram growth than mealworms. Their emission of ammonia (responsible for contamination of groundwater) is also 8 to 12 times higher per kilogram of growth, compared to insects such as grasshoppers and crickets. The production of manure is significantly lower than normal cattle and the land use is much lower than conventional animal production. Based on the above it can be concluded that insects are more efficient and environmentally friendly producers of protein. Furthermore, they reproduce much faster than cattle, are easy to rear and need far less living space. In the processing, new processes and equipment will be designed and developed based on minimum energy consumption to reduce the cost of operation for the processors (eg drying process will be done by sun exposure). The already running pilot rearing facility in Kenya at the Bondo University, indicates that rearing is well possible and simple under local circumstances. The farmers from BADDA in Uganda already started rearing crickets and the found enthusiasm reduces the risks of the project. By gradually building up the number of cricket farms, experience is build up and eventual diseases among crickets can be solved at small scale. The Dutch partners, who already rear insects and crickets, will bring in their expertise on these subjects. The gradual growth in cricket production results in a gradual expansion in market penetration and gives time to develop adequate processing and new product designs. The development of processing equipment will be done locally, to ensure capacity for replication and maintenance. The choice of technologies will be done based on local competences. The project answer to the demand of farmers to develop more activities, thus increase income and of the market to get cheaper access to nutritious food. The short, locally founded value chains that are set up, with NGO and farmers organisation involved, makes corruption not to be expected. Behind Bondo University college professor Monica Ayieko houses thousand and thousands of crickets. She looks into one of the breeding systems to check the number of crickets and their activity. “Did you notice any abnormalities after we changed their food?”, she asks the caretaker. Professor Ayieko manages a research program at Bondo university to improve cricket rearing techniques. She started on a very small scale with just a handful of crickets: “I had no idea what I was doing. Everybody thought I was completely crazy to start this research project. But, I believed in the quality of crickets. They are climate resilient, nutritious and cheap to rear. It was a process of trial and error to find out how to house, feed and take care of them. I’m very proud we finally developed an established colony. Moreover, we process crickets and sell our products at the university and around. Student love our cookies. The profit,all goes back into the research project. Cheerful sounds arise from a little shed in the fields of Kabondo division. Inside of the shed Elsha and her sister Elizabeth are taking care of their crickets. “Your volume is really increasing Elsha,” her sister mentions. “But you still have a long way to go before you beat my number of crickets,” she laughs. Like Elsha, many farmers in Kenya are struggling with climate change. Farmers use to know exactly when to plant and harvest. “However, nowadays everything seems to be mixed up.” Crickets on the other hand do not need a lot of water and do not depend on certain weather conditions. They are very safe to farm considering Kenyan capricious climate.